ASPEN, Colo. - The snakes jumping out of peanut cans weren't the only surprise at the seventh annual U.S. Comedy Arts Festival, which wrapped over the weekend. 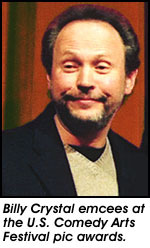 Billy Crystal handed out the film awards, international pics made their presence felt and Miramax even made an acquisition (the Stephen Burrows pic "Chump Change"). But don't get the impression the laugh fest has any pretensions about becoming a gathering of cineastes. Kevin Haasarud, who directed the fest's film portion made it clear that "we don't want to be another Sundance." While deals for film, or comedy acts, might occur, that's not the point. And fest co-founder Stu Smiley said that what's good for the festival is generally good for the acts, too. "Fast deals and quick pickups don't necessarily translate into good product. I prefer to see a talent deal take its time to develop and generate a substantial outcome for the parties involved." Case in point this year: The hip-hop theatrical group the Bomb-itty Crew, which won the fest's theater award for their version of Shakespeare's "The Comedy of Errors." Smiley advised the group's manager to stage their "Bomb-itty of Errors" at the fest for four days, despite a four-week L.A. run, due to the concentration of toppers at the fest. Deal or no deal, comedy managers and agents love the festival as a time to schmooze. "Although I sent out a mass fax about my client's (Sean Conroy) one-man show here, there's no other place in the world where I'm seven feet from Castle Rock's head of television, pitching my client's act to him as a sitcom!" said talent handler Carey Hoffman, who also owns Gotham's Stand Up New York. This year's fest was clearly in touch with its roots. After being absent from the standup club atmosphere for several years, Crystal took the stage as Sammy Davis Jr. on Thursday and Friday nights for "Late Night Lounge With Catherine O'Hara." The SCTV princess also attracted George Lucas to her cantina on Friday, where the helmer soaked in the redneck musical stylings of the Naked Trucker & T Bones show. Before my industryites got off the plane, the fest's film programmers were in a tizzy. A San Francisco law firm repping the Zambesi Club issued a cease-and-desist order to Harry Shearer's film "Teddy Bears' Picnic," due to its negative content about the elite Bay Area men's group. However, there was nothing to worry about. The letter was only a joke and guerrilla promotion for the mockumentary. On Wednesday, Jeffrey Katzenberg's presence at a WorldCom Internet panel made managers giddy, evoking dreams that the DreamWorks topper might be on the prowl for laff product. Crystal handed out the festival's film awards on Friday, exclaiming, "I didn't do the Oscars so I could do this," adding in the middle of the ceremony, "Boy, I wish the Oscars were always like this. I'd be out of there in an hour." In a first for the fest, international films, took home a slew of kudos. The Swedish comedy "Sun Alley" scored the feature award. Silvio Soldini and Doriana Leondeff scored for screenplay with Italy's "Bread & Tulips," and director award was given to Dudi Appleton for his Irish pic "The Most Fertile Man in Ireland." Actor award went to Paul Wilson for "Barstow 2008," vamp Traci Lords was marked as best actress for "Chump Change," and best short award was bestowed upon Tricia Nolan for "Rattler." "Chump Change" also bought the Cinemax audience award.